Hunting was one of the most important activities in the lives of the gentry and nobility, and the specific conventions of the hunt made it a significant activity with a strong element of ceremony. 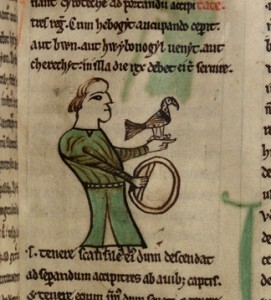 The Law of Hywel Dda contains many references to thirteenth-century hunting, with two of the most prominent officers of the court being the hebogydd ‘falconer’ and the pencynydd ‘chief huntsman’ (literally ‘chief houndsman’). Hunting has an important role in native tales such as the First Branch of the Mabinogi, and it is also worth noting that three of the ‘twenty-four feats’ relate to hunting. Furthermore, a sixteenth-century text entitled Y Naw Helwriaeth ‘The Nine Huntings’ reflects some of the rules mentioned in the Welsh laws, also drawing upon French and English sources including ‘The Boke of St Albans’. It is, however, the poetry that provides the most detailed descriptions of the material culture surrounding hunting in medieval Wales, especially the poems of request or thanks for hunting gear, hounds and hawks. Indeed, as Bleddyn Huws noted, a substantial proportion of requested items relate to hunting, reflecting its status as one of the favourite aristocratic pursuits. A variety of different animals were hunted, but it was hunting deer with hounds, and hunting birds with hawks, that seem to have been the most prestigious activities. There were a number of rules relating to when certain animals could be hunted and who was allowed to hunt in specific parks and forests. For example, it seems that the hunting season for stags in England was between 24 June and 14 September; and between 14 September and 2 February for hinds. Hunting outside these periods was unlawful. It must also be remembered that the forests of Wales had been appropriated by the English Crown and barons long before the fifteenth century. There are, however, cases of Welshmen being given permission to hunt in forests. : W. Linnard, ‘The Nine Huntings: A Re-examination of Y Naw Helwriaeth’, Bulletin of the Board of Celtic Studies, 31 (1984), 119-32.
: B.O. Huws, Y Canu Gofyn a Diolch c.1350-c.1630 (Caerdydd, 1998), 65.
: R.B. Manning, Hunters and Poachers: A Social and Cultural History of Unlawful Hunting in England 1485-1640 (Oxford, 1993), 23.
: R. Richards, Cymru’r Oesau Canol (Wrecsam, 1933), 162.